The Ghostbusters! Peter Venkman, Ray Stantz, Egon Spengler and Winston Zeddemore. Whenever there’s a ghost, call this team and let the professionals handle it. 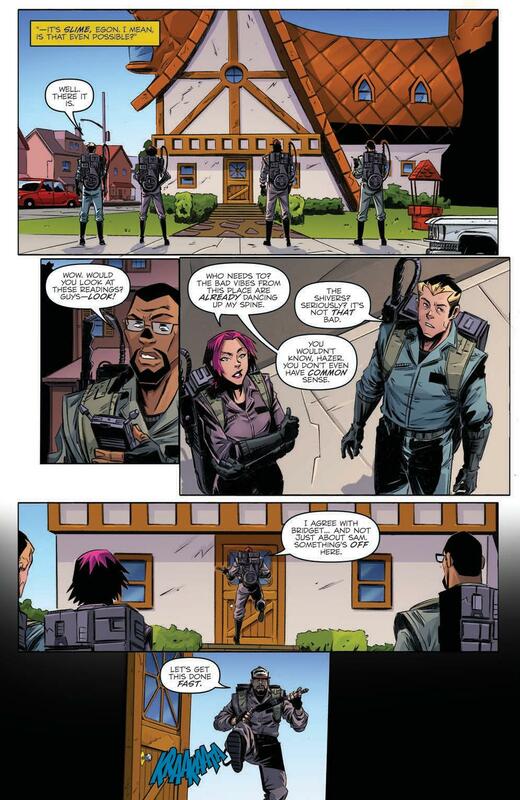 Well, that’s something I would have said twenty years ago, because to celebrate 20 years of IDW Publishing we’re jumping ahead two decades to check in with the next generation of Ghostbusters. And regardless of what year it is, it seems like it’s always Bustin’ time! 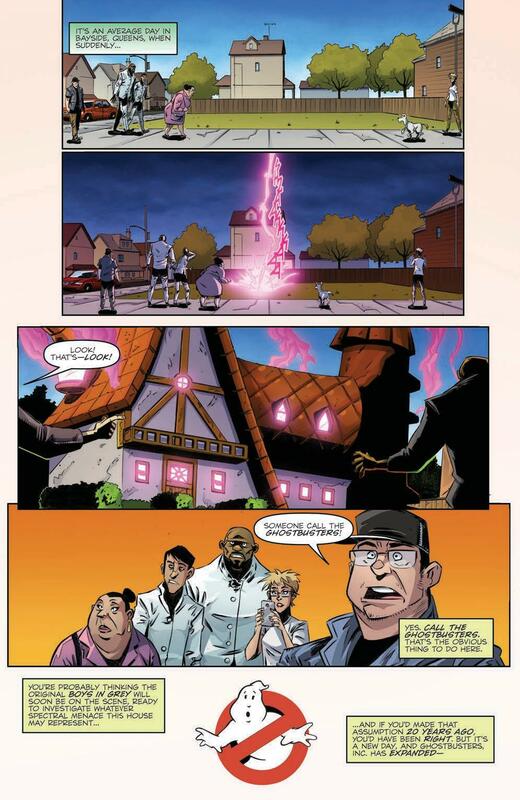 Interestingly, Erik Burnham and Dan Schoening have opted to base this future team on the 2011 video game Ghostbusters: Sanctum of Slime. As we join them, the team has just finished dealing with the events of Ghostbusters: Crossing Over, and as such are in desperate need of a break. However, before anything like that happens, they have to deal with a seemingly routine call. Seemingly being the key word, because as we all know, with the Ghostbusters nothing is ever quite as simple as it first looks. 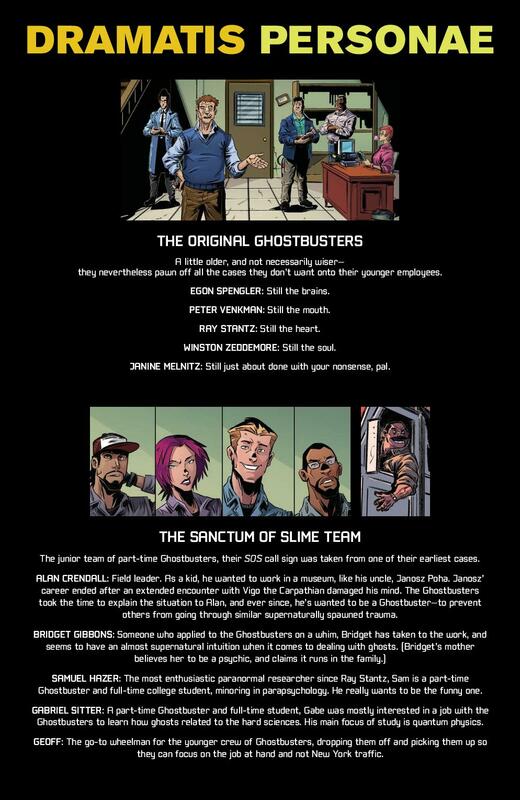 Look, if you’re not already familiar the Sanctum of Slime team, then apart from a brief character bio at the start of this issue you’re not really going to get to know much here. 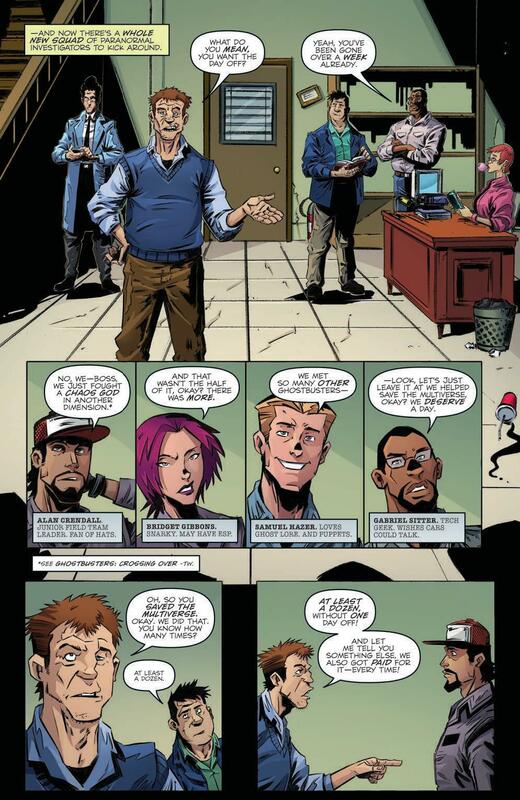 The focus in this issue is squarely on team leader Alan Crendall who, despite being a tad generic, is the member of the team with the most to do as he ends up working with the original ‘Busters. And, in spite of the somewhat lackluster leading man, this ends up as a classic Ghostbusters story with an inventive twist on a seemingly straightforward job. 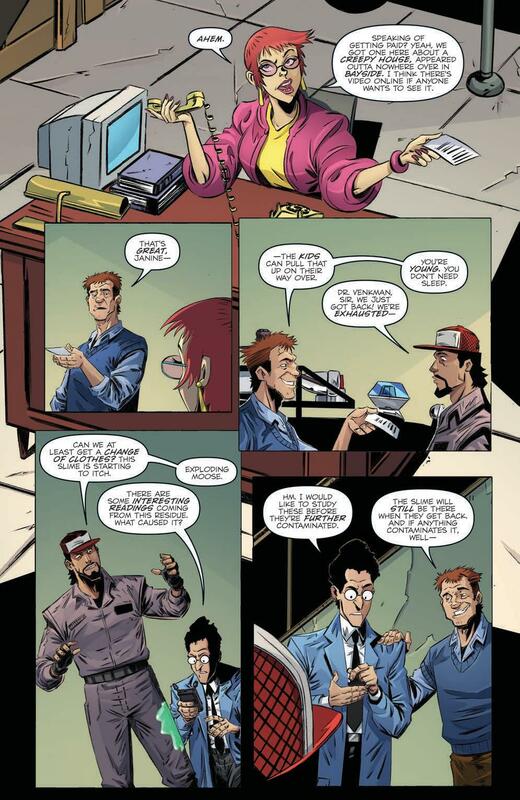 While not featuring the original GB team to the same degree as usual, the classic creative team is thankfully here, with Dan Schoening and Luis Antonio Delgado bringing Burnham’s story to life with their usual energy and flair. With these new characters being the focus it does means that some of the characters look noticeably different (read: older), which makes perfect sense given the story is set 20 years into the future. Delgado’s colours also seem to be little more subdued and toned-down than usual, which helps to give the book a darker edge. As a cool standalone one-shot, this is an enjoyable read. 20 years of IDW is no small achievement, and it’s fun to see the classic team a lot older. 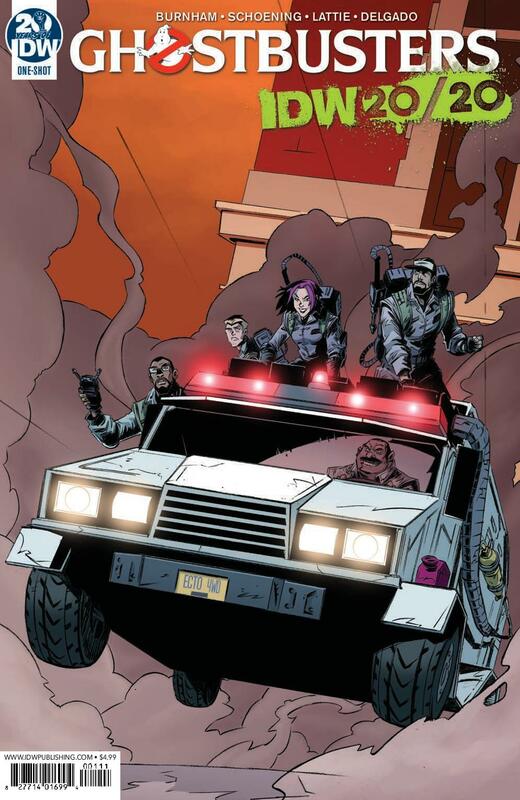 Ultimately, the creators give us a glimpse at an intriguing potential future here, albeit one that doesn’t seem to tie in to the grander scheme of the Ghostbusters comic universe. And if you’re able to take that into account and view this as a self-contained story removed from the wider GB continuity, this one’s definitely worth a look.